You finished second at Canadian Tire Motorsports Park in 2015. In general, do you like road racing? What makes Canadian Tire Motorsports Park challenging? A lot of high speed corners, a lot of elevation changes, what’s the most difficult part for you? Chassis Chatter… The No. 88 ThorSport Racing team will unload chassis No. 46 for Sunday’s NCWTS 250 at Canadian Tire Motorsports Park (CTMP). This chassis will make its debut this season. Headed Home… Scott Simmons, the Menards Toyota Tundra Tire Specialist, calls Canada home. The Cambridge, Ontario native, who grew up racing go-karts and mini stocks at the age of 15, is in his second year with ThorSport Racing, and the No. 88 team. Canada Stats… Crafton will make his fourth career NCWTS start at CTMP on Sunday. In fact, the two-time series Champion has more starts (3) than any other active series drivers at the 2.459-mile road course, and has completed the most laps (192). In The Loop – Canada… According to NASCAR’s Loop Data Statistics, Crafton ranks fourth in Average Running Position (8.7), fourth in Driver Rating (93.9), and first in Laps in the Top 15 (181) entering this weekend’s event. 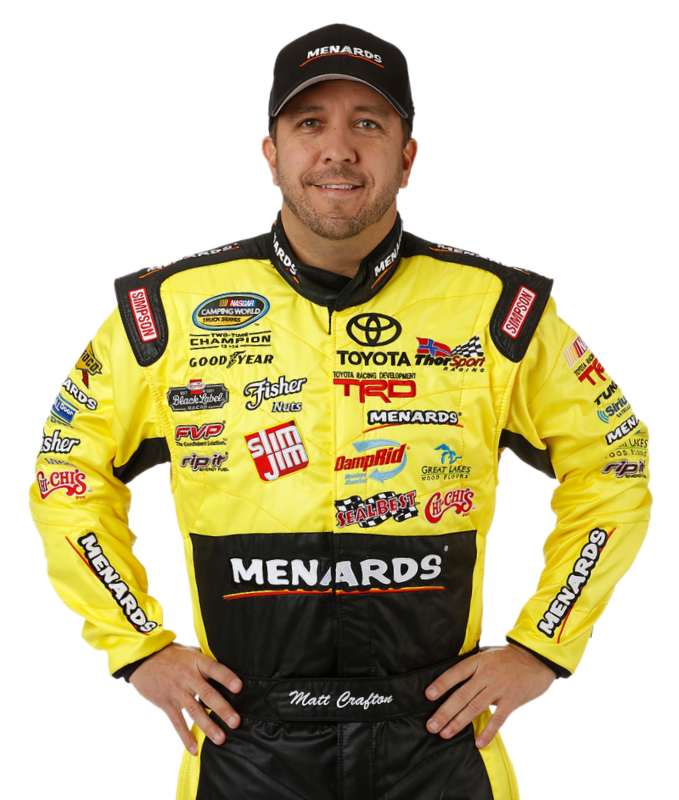 Chase Status – Two To Go… Crafton is currently fifth in the 2016 NCWTS driver point standings after 14 races this season, but second in the NCWTS Chase. As one of two drivers with multiple wins in 2016, the two-time NCWTS champion is all but guaranteed a spot in the eight driver Chase which kicks off at New Hampshire Motor Speedway in Loudon on September 24. In The Loop – 2016… According to NASCAR’s Loop Data statistics, Crafton ranks first in the following categories; Fastest Laps Run (219), Laps in the Top-15 (1935), and Laps Led (421). The ThorSport Racing driver ranks second in Average Running Position (7.75), and Driver Rating (104.2). Canada Rewind – 2015 … Crafton started third, led the field once for one lap, and finished second. Race Rewind – Michigan… Making his 15th career start at Michigan International Speedway, Crafton qualified second, led the field four times for 23 laps, and finished seventh. Major Milestone…The Tulare, California native extended the NCWTS record for consecutive starts to 375 in the Careers for Veterans 200 at Michigan International Speedway, passing four-time NCWTS champion Ron Hornaday, Jr with 360 starts in the 2015 NCWTS season finale at Homestead-Miami (Fla.) Speedway. Crafton made his series debut at Auto Club Speedway in November 2000, and enters his 16th full-time season in the NCWTS, and his 15th full-time season with ThorSport Racing in 2016.